Last month, Africa’s eurobond debt passed a $100 billion milestone but anyone who’d been paying attention to the talk of rising African debt wouldn’t have been completely surprised. African countries issued a record $27.1 billion eurobond debt in 2018 alone, according to analysts at Renaissance Capital (RenCap). So far in 2019 three countries (Egypt, Ghana and Benin) have already issued $7.6 billion. More issuances are expected from South Africa, Kenya, Angola, Egypt (again) and Nigeria. In 2010 just 10 African countries had issued eurobonds, it’s now 21 and there are likely more eurobond virgins coming. All this might sound worrying at first glance but analysts at Brookings say we shouldn’t be alarmed at the size of debt and insist another systemic sovereign debt crisis is not imminent. The debt-to-GDP ratio is low at 53% compared with 90% during the worst excesses of the 1980s and 1990s. But what Brookings does find “unsettling” is the rapid rate of increase in debt, the rising debt servicing costs and the nature of the debt structure relative to the “highly indebted nations” years. There are several reasons African debt has been rising again. These include recovering from the global financial crisis and the commodity pricing slowdown, the long-term low domestic savings rates and more democratically-elected governments trying to deliver on infrastructure promises. Low interest rates in the US and other advanced economies has also meant more global investors have been attracted to frontier markets like in Africa. At some point you might be expecting the old investor saying: “This time it’s different.” And it is different, but that doesn’t make it necessarily better if care is not taken. Yes, debt levels aren’t the problem, in fact Brookings predicts debt ratio levels falling to 47% by 2023. But one of the concerns has been the short term maturities of 5 to 10 years for the early eurobonds, which don’t often match the life of the infrastructure project they were supposed to support. More recently there have been more 30-year bonds which is seen an improvement with more flexibility. However, the bigger challenges for African countries are to do with the debt serving costs and the repayment risks. Debt servicing costs doubled to 10% in 2017 from 5% in 2012 and RenCap is worried about a large spike of $12 billion in repayments due in 2024—mostly from smaller oil-importing countries. The worry is that if the global economy is in bad shape in 2024 it won’t be easy to roll over debt. The future of Boeing’s 737 Max is heading to US courts. Transport officials in Ethiopia this week said pilots on the ill-fated ET 302 flight repeatedly followed Boeing’s instructions to bypass a new flight system that can destabilize its plane before it crashed. As both the aircraft manufacturer and state carrier tackle their biggest crisis in years, law firms are now reaching out to families of victims in preparation for potential lawsuits against both companies. The billion-dollar IPO of the biggest e-commerce player in Africa gathers pace. Jumia has moved closer to its anticipated initial public offering. The e-commerce giant set a price range of $13 to $16 per share and will now commence an investor roadshow during which its final share price will be settled, depending on gauged interest, ahead of the IPO set to launch this month. South Africa’s election season rhetoric has sparked fresh xenophobic attacks on African migrants. Xenophobic violence has erupted in South Africa again, in an election cycle that has seen politicians ramping up anti-immigrant rhetoric in a country where African foreigners are easy targets. Politicians may denounce the violence, but they simultaneously scapegoat foreigners around hot-button issues like crime and jobs. Africa’s historic trade deal has garnered votes to go into force. The Gambia this week became the 22nd country to approve the African Continental Free Trade Area, helping the deal bypass the minimum threshold to go into implementation. The agreement will establish the world’s largest free trade area since the formation of the World Trade Organization 70 years ago. Volkswagen is testing the future of its global mobility solutions in Rwanda. It’s been a year since the German automaker put up an assembly plant and launched a ride-hailing service in Rwanda. Reporting from Kigali, Abdi Latif Dahir looks into the carmaker’s various innovations for the market and if they can be replicated elsewhere worldwide. What should South Africa do with reminders of its painful past? South Africa is currently debating whether its apartheid-era flag should be declared hate speech after white supremacist groups started waving it. The debate pits freedom of speech versus racial injustice. Between Pretoria and Johannesburg, Lynsey Chutel looks at other monuments to the past and asks whether they should be torn down or renewed. Africa is set to be the global center of Christianity for the next 50 years. 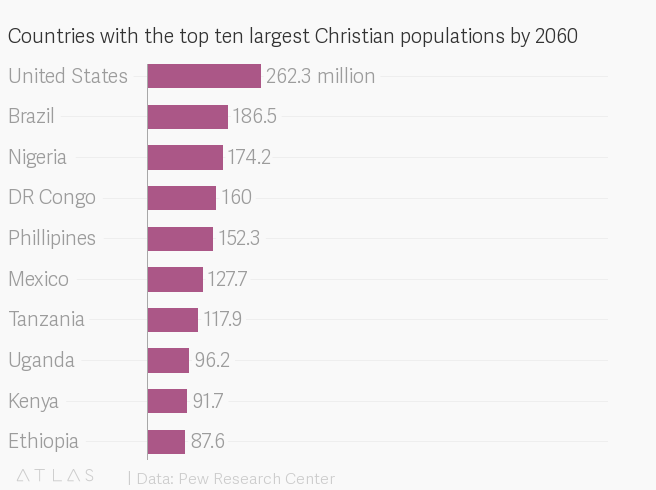 By 2060, six of the world’s ten largest Christian populationswill be in Africa, up from three in 2015. Tanzania, Uganda and Kenya are projected to join the list replacing Russia, Germany and China. The ugly history of Ghana-Must-Go bags. Back in 1983 as Nigeria began to feel its first major economic slump due to an oil price crash, the government of president Shehu Shagari decided to expel nearly 2 million illegal foreigners, the majority of whom were Ghanaians. For Mail & Guardian, Shola Lawal met up with some of those who had to leave back then. US lobbyists with Trump ties are being recruited by African politicians. From Nigeria and Cameroon to Gabon and Zimbabwe, there has been a rise in lobbyists getting paid handsome sums for connecting African governments and opposition politicians to Donald Trump’s White House, finds Dionne Searcey for the New York Times. Rwanda to mark 25 years since genocide (Apr. 7). The country will hold events to commemorate the devastating genocide that erupted between the country’s ethnic Hutus and Tutsis, leaving up to an estimated 800,000 people dead. Egypt’s president meets Trump (Apr. 9). President Abdel Fattah al-Sisi will meet Donald Trump in the White House to discuss security, economic, and counterterrorism cooperation. *This brief was produced while listening to Akanamali by Sun El-Musician feat Samthing Soweto (South Africa). Our best wishes for a productive and thought-filled week ahead. Please send any news, comments, suggestions, Jumia shares, but not African debt to africa@qz.com. You can follow us on Twitter at @qzafrica for updates throughout the day.